"Half The Road" trailer from kevin tokstad on Vimeo. Kathryn Bertine is a remarkable multitalent. In addition to having worked as a professional figure skater, journalist, triathlete and pro road cyclist she has become a strong voice in the call for greater visibility for women in sports. It takes reckless courage for someone scraping by on the less-than-poverty wages of a female bike racer to decide the best way to promote her sport is by making a full-length documentary video but, astonishingly, “Half the Road,” featuring an impressive cast of athletes and experts, is the result and has been playing to packed cinemas at special screenings throughout the United States and other countries. What is remarkable is not so much whether it is good or bad (and it is pretty good!) but that it exists at all. In the modern age of global connections there are novel ways of raising money and Ms. Bertine turned to crowdfunding, pitching her passion for bike racing in May 2013 to the world after a year of effort and working with cinematographer Kevin Tokstad to get things launched. The campaign aimed to raise $65,000 and by close of the offer in July had squeaked by as 579 funders pitched in $65,808 and Kathryn and modest team were off to the races. 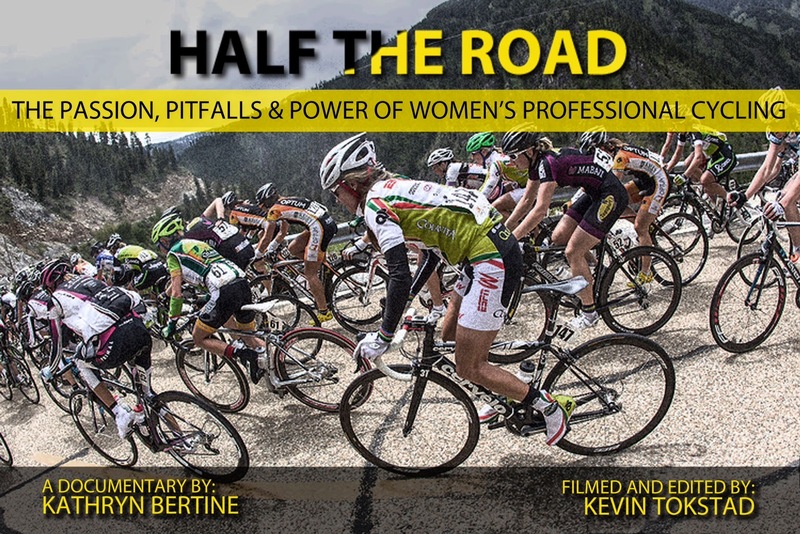 Half the Road is a documentary film that explores the world of women’s professional cycling, focusing on both the love of sport and the pressing issues of inequality that modern-day female riders face in a male dominated sport. With footage from some of the world’s best international UCI races to interviews with Olympians, World Champions, rookies, coaches, managers, officials, doctors and family members, Half the Road offers a unique insight to the drive, dedication, and passion it takes for female cyclists to thrive. Both on and off the bike, the voices and advocates of women’s pro cycling take their audience on a journey of enlightenment, depth, strength, love, humor and best of all, change & growth. I began this documentary with the assumption it was about women’s professional cycling. A few months in, I realized the film was about equality and society, as told through the medium of cyclists. Half The Road is my hope that someday the whole world will see sports not as “men’s” or “women’s” but as equal athletes on equal playing fields. There is a lot of wonderful material in this video. We see some exciting bike racing and have the opportunity to hear an impressive selection of women athletes talk about their careers and, often, the struggle to make ends meet, let alone get recognition. One cannot help but be impressed by racer Nichole Wangsgard, a university professor with a Ph.D, who had to keep her racing secret from her employers, and dealing with with must have been a very difficult situation in being part of a gay couple in Utah. Many of women cycling's star riders have their turn in front of the camera including the Netherland's Marianne Vos (three time former World Road Champion) who is one of the few to be a genuine sports celebrity in her home country and Kristin Armstrong, who came back from having a child to win the rainbow jersey in the time trial. It is an indication of how tough things are for women that Armstrong, winner of two Olympic gold medals and twice World Time Trial Champion, is usually confused with Lance Armstrong's wife of the same name when mentioned at all. Many of the cyclists are probably known to fans of women's pro racing but barely to the greater universe of fans of men's racing and pretty much invisible to the sports world beyond that. These women train hard, race hard and put on a good show on the road. Why is their sport in the state it find itself in? Kathryn Bertine points an accusatory finger (well, more like waves a clenched fist) in the direction of several culprits. The Union Cycliste International (UCI) is the sport's governing body. It has historically shown no interest in the women's side of the sport except to invoke ridiculous rules such as the one limiting the average age of women pros on a team. This rule, which certainly would be detrimental to someone like Ms. Bertine who is in her 30s, is stupid and the point is made. Not once but several times. And this is the major drawback to this film, otherwise commendable in so many ways. It obviously comes with a message but rather than simply leaving the women to tell their often compelling stories the producers add too much to underscore the message that there is inequality out there. Poor Brian Cookson, elected to reform the UCI in 2013, looks rather gormless as he is shown looking uncomfortable while lamely suggesting that women might be “weaker.” This is a “Gotcha!” moment. Cookson was the key figure in the revival of near-bankrupt British Cycling, which has had terrific success not only in men's racing but also seen a generation of fine women competitors develop. The UCI, it is revealed at the end of the film, has dropped the average age rule for women's teams and this too weakens the message. The other culprits besides the UCI are race organizers who do not give opportunities to women to compete and take advantage of the infrastructure established for men's events. This is a fair enough suggestion but, playing the Devil's Advocate here,(disclaimer: I was one of those 579 funders of this video) it is not clear how this would work in an era when even the men's races struggle for financial support. For example, after disillusionment set in following revelations about Jan Ullrich, Germany went from three top-level men's teams to none and lost most of its top-level races, with only the dreadfully boring Cyclassics in Hamburg still on the UCI World Tour. The United States, where bike racing remains a marginal sport at best, was once host to stage races like the Tour DuPont and the Tour of Georgia but the highest visibility event remains the Amgen Tour of California which, while not on the UCI World Tour, still draws top racers from Europe. And the structure of men's racing is far deeper, with the World Tour at the top with “farm teams” at the UCI Pro Continental and UCI Continental levels below. In 2014 there was a total of 32 teams in the single UCI Women's Teams division. Of course one reason there might be comparatively few women is the sparse selection of races: in the UCI Women's World Cup in 2006 there were 12 races; in 2014 only 9. The difficult situation that women's pro cycling finds itself in is tough enough but the filmmakers brought in the issue of inequality in women's sports as a whole. There is a bit too much coverage devoted to the belief that once upon a time that women were simply too weak/ladylike/modest to compete it the rough-and-tumble world of competition. There is an interview with the remarkable Kathrine Switzer, who entered the 1967 Boston Marathon when women were not allowed to do so and roused the ire of officials. A great story but women have been allowed to run marathons (Switzer won the women's class at the 1974 New York Marathon) for four decades so there is not really an issue there as Kathryn Bertine is arguing, it appears, that women should have bike races that parallel men's events rather than unisex ones. And this brings us to the unspoken question of why women's sports, with the possible exception of tennis and golf, have never managed to achieve the financial status or visibility of any men's sports. As to team sports, of which cycling is one, there are no women's sports approaching the level of men's at all. The FIFA Women's World Cup, to be played in Canada in 2015, will see many teams competing with players who are only semi-pros or amateurs as there is no money either in what is for men the most popular sport in the world. The third theme that enters the story is Kathryn Bertine's own attempts to obtain a berth at the 2012 London Olympics in women's road racing and while this underscores how difficult it is for small nations to compete (Bertine rides for the Caribbean islands of St. Kitts and Nevis) this parallels the problems that poorly-funded teams just can't compete with ones rolling in dough. This is a problem not just for small nations or women's teams but appears throughout sports and while it is an issue for consideration it burdens this documentary, muddying the message by just piling on too much in the 106 minutes of running time. The video would benefit from a more focused story but it is understandable that a first-time director, with no video experience at all, would be enthralled by so much excellent footage that punchier editing would fall a bit by the wayside. But forget the nitpicking since “Half the Road” is valuable for exposing us to some great athletes and interesting people we would never get to know if we had to wait around for a major network or pay-channel to provide some exposure. With the Amgen Tour adding a three day women's event in its next edition and this year's successful La Course at the Tour de France in Paris we might be seeing a light at the end of a long, dark tunnel that is opportunity in women's sports. There is much food for thought here, if not many proffered solutions. I wondered if any other female pro cyclists might talk to me about their obstacles, their ambition, and their unconditional love for a sport that was often thankless, cruel, and unresponsive to change. What is the true joy of cycling, and how do we fix the wrongs? I’ve always considered “sport” a euphemism for “society”– I believe by changing one, we affect the other. “Half the Road” is available as a download at iTunes or as a DVD directly from the producers at www.halftheroad.com for the nominal sum of $18.71. Even better, head out to one of the screenings and show your support for women's sports as well. A list of these events as also at the Half the Road website.